PLEASE VISIT JOHN DIERCKX MUSIC FOR MORE COMPLETE INFORMATION. I started playing guitar at the age of 16 and after high school he studied (jazz) guitar at the Rotterdam Conservatory. Music was my first career and despite pursuing a career in the corporate world, music has always stayed a parallel career, as a musician and tutor. 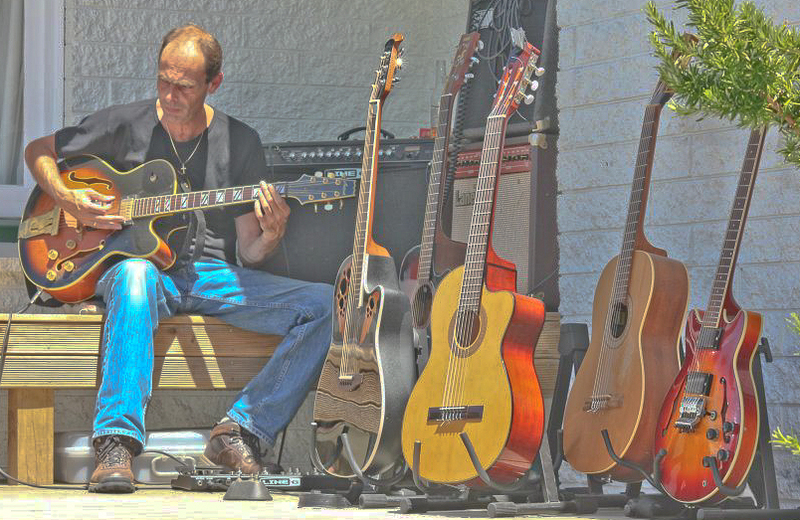 I am proficient in most contemporary styles (both electric and acoustic). Since January 2010 I am available again for private tutoring for guitar and jazz theory. As said before I have considerably been influenced by Joe Pass. Since I heard him play unaccompanied jazz guitar I knew that was one of the areas I wanted to get better at. To this day I am still trying to improve, realising what an incredible guitar player this man was. A classic and one of my favorites. Romantic electric guitars. Love this old Chales Aznavour song and remember him singing it. Hope it captures that same European romantic flavour. Every now and than I like to do something else. This is a song for slide guitar. Swampy sounds !!!!! And dad, if there’s internet up above, be sure to check this one, typically your kinda music !!!! This one is an old style slide blues, the way my dad would have liked it, so dad, open up those internet gates to heaven and sit back and relax. A guitar duo recording with Jason Wilcox, a Christchurch based guitarist and singer, John does the comping and guitar solo over form Jason does the improvisation on intro, singing and fills. A great song of the band Friendship, we covered with our fusion band Booby Trap. Linda’s Day Off Life (my old funk and soul band). A song by Henk de Ligt for me to go wild, thanks bro I enjoyed it every time and most of all the audience. A nightly Jam alone with the computer. Inspired my the one that made me pick up a guitar: Carlos Santana. The melody of the song was one that had been going through my head all day and finally late at night I got a chance to record it. One day I will hopefully finish it. A recording with Robbi Spencer, US based recording artist, songwriter and producer. Recording made via the internet. I play all guitar parts here. One day I am sure that we will sit down together and write some great modern gospel songs. A recording with well acclaimed Australian based guitar player, song writer, recording artist and producer John Castellain. This song was recorded via the internet. John Castellain did some amazing things with the arrangement and production. I remember so well how I wrote the double hand tapping harmony in the basis not realizing that it would end up really painful trying to keep that up for a whole song. But with some extra training I managed to get it out. One day I hope to sit down with him and just jam our hearts out under the stars. My very first rock original. Pff I am getting an old dude. Just going crazy all improvised. I was just listening to 3 by “…. Wow man, that is a cool little jam. Swing and all. It’s as good as, I can tell you that for sure. Nice geetar licks John! Keep up the good work in your jazz trio and keep recording your live stuff and post it here, k? We love it. John….. WOW….WOW….WOW… Listening to “Days of Wine and Roses as I’m typing this.. Just so nice.. I really liked your interpretation of ‘Autumn Leaves’ and decided to put it in my own station. Dou you play much around there? dig the Cole Porter…nice my brotha… Robert E. 😉 Robert Eldridge a fantastic guitar player. Proud of you bro and believe this will bring you great joy and happiness. Look forward to hearing how you do in this area. Already I’ve heard ppl wanting lessons with you!